Naqada IIIB (b1-b2) plain, anonymous and personalized serekhs with other possible indicators of chieftains' and sovereigns' names, from Upper and Lower Egypt, Lower Nubia and Southern Levant (found on various types of objects, especially on pottery jars). Note that some of these compounds could either be general indicators of sovereignty (as plain and anonymous serekhs) or not be royal names at all, with a completely different purpose and meaning (as ns. 19, 26, 32). Ns. 11, 17, 32, 37 are very hard to set in a precise chronological order (cf. text); also the general sequence and assemblage of the serekhs must not be interpreted as reflecting true successions stricto sensu (except those from the Abydos tombs of Iry-Hor, Ka and Narmer). The serekhs are not to scale; most of them are from inscriptions or artifacts containing further hieroglyphs and/or images which have been cropped out. Some single serekhs/names of uncertain status have been excluded, as the one of 'Djehwty-Mer' (?) from Tarkhan t. 412 (cf. Petrie et al., Tarkhan I, pl. 31, nr. 71). - Abbreviations: MDAIK 38, fig. 14-15 = Kaiser/Dreyer, in: MDAIK 38, 1982, 211-269, esp. 262-269 (n. 193ff. ), fig. 14, 15. VdBrink 1996 = Van den Brink, in: Spencer (ed. ), Aspects, 140-158. For the other references cf. the Bibliography. - Note: the inscriptions on jar or jar fragments are (pre-firing) incised, unless specifically stated. 1-2: Abydos, Umm el-Qaab, tomb U-s ink inscr. anonymous serekhs on cyl. jars (Dreyer, in: MDAIK 55, 1999, fig. 4a). 3-4: Abydos, Umm el-Qaab, tomb U-t ink inscr. anonymous serekhs on cyl. jars (Dreyer, in: MDAIK 55, 1999, fig. 4b). 5: Abusir el-Meleq t. 1021 jar (MDAIK 38, fig. 14-15, nr. 9)[sic]. 6: Abusir el-Meleq t. 1144 jar (MDAIK 38, fig. 14-15, nr. 10)[sic]. 7: Wadi el-Arish (previously believed to be from Rafiah) jar (Kaiser/Dreyer, in: MDAIK 38, 1982, 269, fig. 16, nr. 2). 8: Wadi el-Arish (previously believed to be from Rafiah) jar (Kaiser/Dreyer, in: MDAIK 38, 1982, 269, fig. 16, nr. 1). 9: El-Beda jar (Clédat, in: ASAE 13, 1914, 119ff., fig. 5); name reading beside the plain serekh: (Bark? )-NEITH (?). 10: DOUBLE FALCON; 10a-c: El Beda jar fragments (Clédat, in: ASAE 13, 1914, 119ff., fig. 4, 3, 6; 10b is from a complete jar, ibid., pl. 13); 10d: Turah SS Ezbet Luthy (MDAIK 38, fig. 14-15, nr. 4); 10e: Sinai (ibid., fig. 14, nr. 5). For more serekhs of king (?) DOUBLE FALCON cf. van den Brink, in: Archéo-Nil 11, 2002 (group 2a-c). 11: Metropolitan Museum Palette (MMA New York, 28.9.8; Fischer, in: Artibus Asiae 21, 1958, 82ff., n.34, fig. 19); uncertain datation; for similar palettes from later (Naqada IIIC1-2) contexts cf. 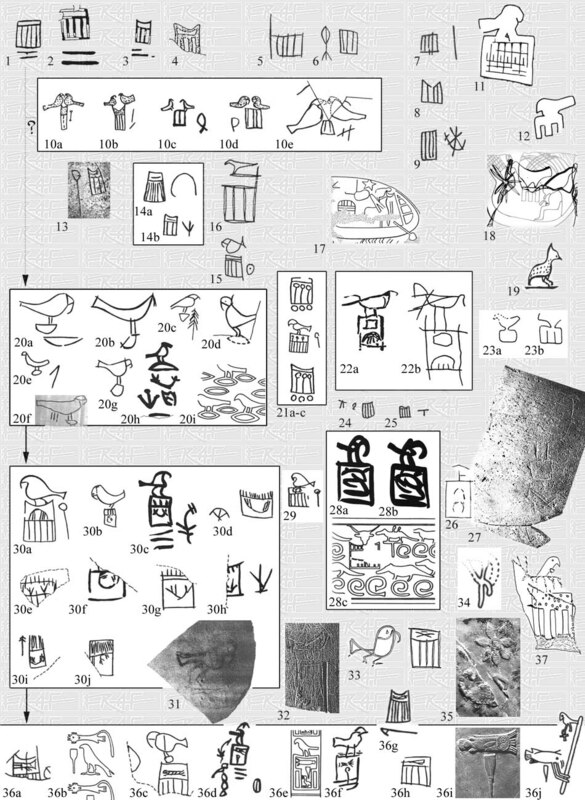 the Minshat el-Ezzat palette (quoted in the text and in n. 101) and the palette fragment Kaiser/Dreyer, in: MDAIK 38, 1982, 228, fig. 6 (lycaon tail, upset ?). 12: Seal impression from Siali, Lower Nubia (Williams, Qustul, 168, fig. 58a). 13: *HAT(Y)-HOR; Tarkhan t. 1702 jar (U.C. London 16084; vdBrink 1996, tab. 1, nr. 9; pl. 26a). 14: NY(-HOR); 14a: Turah t. 16g9 (T64) jar (MDAIK 38, fig. 14-15, nr. 7); 14b: Turah t. 19g1 (T89) jar (ibid., nr. 8). 15: NY-HOR [or NAR(MER)?] Ezbet Tell jar fr. (vdBrink 1996, tab. 1, nr. 21; id., in: Archéo-Nil 11, n. 38). 16: Anonymous serekh ? ; steatite cylinder seal from Helwan t. 160H3 (Kohler, in: GM 168, 1999, 49ff., fig. 1). 17: Metropolitan Museum Knife-handle, recto: boats procession (Williams/Logan, in: JNES 46, 1987, 245ff., fig. 1). 18: Qustul t. L24 incense burner; boats procession towards a shrine (Williams, Qustul, 142, fig. 55, pl. 34). 19: Qustul t. L23 painted vessel; complex scene with animals, tree and a shrine (?) paliçade (Williams, Qustul, pl. 84). 20: *IRY-HOR; 20a-g: Umm el-Qaab, Abydos jar fragments (20e complete jar) (MDAIK 38, fig. 14-15, nr. 13, 14, 15, 22, 21, 19, 16 respectively); 20h: same site, Kaiser/Dreyer, in: MDAIK 38, 1982, 234, fig. 10d; 20i: seal impression from Zawiyet el Aryan, nearby tombs 86-89 (Kaplony, IAF III, fig. 13). 21: *HEDJW-HOR (? ); 21a: Turah t. 15g2 (T54) jar (vdBrink 1996, tab. 1, nr. 18); 21b: Eastern Delta jar (Metropolitan Mus. 61122; Fischer, in: JARCE 2, 1963, fig. 1); 21c: Turah t. 17L7a (T313) jar (vdBrink 1996, tab. 1, nr. 19). 22: P-Elephant (? ); 22a-b: Armant site 34 graffiti (Wilkinson, in: JEA 81, 1995, fig. 1a-b). 23a-b: Qustul t. L11 'Archaic Horus' incense burner (Williams, Qustul, pl. 33). 24: Plain serekh from Minshat Abu Omar t. 1210.21 jar (vdBrink 1996, tab. 1, nr. 11). 25: Plain serekh from Minshat Abu Omar t. 520.3 jar (vdBrink 1996, tab. 1, nr. 12). 26: Qustul t. L2 pot-mark on jar (Williams, Qustul, pl. 78a). 27: PE-HOR ? Qustul t. L2 pot-mark (?) (post firing incision) on jar fr. (Williams, Qustul, pl. 77). 28: HORUS CROCODILE (Shenyw, The Subduer)? 28a: Tarkhan t. 315 ink inscribed cylinder jar (Kaplony, IAF III, pl. 1); 28b: Tarkhan t. 1549 ink inscribed cylinder jar (ibid., pl. 2); 28c: Tarkhan t. 414 seal impression (ibid., fig. 18) with a serekh-like image representing the temple of Sobek; the relationship between ink inscriptions and seal impression has been postulated by G. Dreyer (in: Horus Krokodil). 29: ? Minshat Abu Omar t. 160.1 jar (MDAIK 38, fig. 14-15, nr. 34). For the various interpretation of the name cf. text. 30: HORUS KA; 30a: Helwan t. 1627H2 jar (MDAIK 38, fig. 14-15, nr. 23)[sic]; 30b: Helwan t. 1651H2 jar (MDAIK 38, fig. 14-15, nr. 24)[sic]; 30c: ink on jar fr., Abydos, t. B7/9 (Petrie, Abydos pt. 1, pl. 2, nr. 15); 30d-j: Abydos, Umm el-Qaab t. B7/9 jar fragments (MDAIK 38, fig. 14-15, nr. 27, 29, 31, 28, 32, 26, 33 respectively). 31: HORUS KA (?) Adaima, carbon inscr. on jar fr. (Grimal, in: BIFAO 99, 1999, 451, fig.1); uncertain reading. 32: *HWT-HOR (?) Wadi Um-Balad jar fr. (Kohler, in: Castel-Köhler-Mathieu-Pouit, in: BIFAO 98, 1998, 57ff., fig. 12); uncertain reading: might be Hor Aha, Djer or another later ruler's (or royal domain) name. 33: *NY-NEITH; Helwan 257H8 jar (Köhler/van den Brink, in: GM 187, 2002, fig. 2.2). 34: Royal Macehead from Hierakonpolis (Quibell, Hierakonpolis, Pt. 1, pl. 26a; Adams, Ancient Hierakonpolis, pl. 1). 35: SCORPION (II), Macehead from Hierakonpolis (Ashmolean Museum, Oxford E3632; Quibell, Hierakonpolis, Pt. 1, pl. 26c; photo after: S. Donadoni in: 'Le grandi Scoperte dell'Archeologia', vol. 1.33, p. 17, De Agostini, Novara). 36: HORUS NARMER; 36a: Umm el-Qaab, Abydos (MDAIK 38, fig. 14-15, nr. 40); 36b: same site, seal impression from tomb T (Den) (Dreyer, in: MDAIK 43, 1987, fig. 3); 36c: Zawiyet el-Aryan t. Z401 (?) jar fr. (MDAIK 38, fig. 14-15, nr. 37); 36d: Tarkhan (?) ink inscr. cylinder jar (Kaplony, IAFS, fig. 1061); 36e: seal impression from Tarkhan t. 414 (Kaplony, IAF III, fig. 25); 36f: Tarkhan t. 414 jar (MDAIK 38, fig. 14-15, nr. 35); 36g: Tarkhan t. 1100 jar (MDAIK 38, fig. 14-15, nr. 39); 36h: Hierakonpolis jar fr. (MDAIK 38, fig. 14-15, nr. 43); 36i: (recto of) Narmer palette from Hierakonpolis (Cairo Museum JdE 14716, CG 32169; Quibell, Hierakonpolis, Pt. 1, pl. 29; photo after: S. Donadoni, op. cit., p. 14); 36j: Hierakonpolis cylinder (Kaplony, IAF III, fig. 5). 37: Anonymous serekh, Gebel Sheikh Suleiman graffito (Murnane, in: JNES 46, 1987, 282ff., fig. 1A); uncertain date.